North Korea announced Sunday that Ri Son-gwon, its point man on inter-Korean affairs, will be the head of its delegation for an upcoming high-level meeting with South Korea. “According to its list (of delegates), North Korea’s chief delegate will be Ri Son-gwon, chairman of the Committee for the Peaceful Reunification of the Country,” Seoul’s Unification Ministry said Sunday, delivering the notification it received after the inter-Korean hotline communications began at 9:30 a.m. The North’s message comes a day after the South offered to send a five-member delegation led by Unification Minister Cho Myoung-gyon to the talks scheduled for Tuesday. Both sides agreed Friday to hold their first official dialogue in more than two years at the border village of Panmunjom. Ri is the current chairman of the CPRC, a state-run agency handling inter-Korean affairs. The ranking military official also spoke on behalf of North Korean leader Kim Jong-un when announcing Pyongyang’s willingness to restore the inter-Korean hotline. The South Korean delegation will include two deputy ministers from the Unification Ministry and the Ministry of Culture, Sports and Tourism along with the vice president of games planning for the PyeongChang Organizing Committee. Mirroring Seoul’s representatives, North Korea drew a list of officials in similar positions in its government, including Ri. 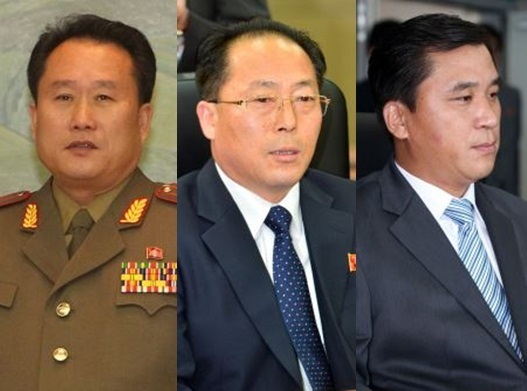 The others are Jon Jong-su, vice chairman of the CPRC; Won Kil-u, vice minister of physical culture and sports; Hwang Chung-song, director of the CPRC; and Ri Kyong-sik a member of the North’s Olympic committee. Although Cho and Ri have each participated in a slew of cross-border meetings in the past, the upcoming event is expected to be their first encounter. Both are viewed as veteran negotiators with vast experience in inter-Korean talks. Cho, 61, played a key role in preparing for a summit in October 2007 between late President Roh Moo-hyun and then-North Korean leader Kim Jong-il. He served as a secretary under the Roh administration from 2006-2008. Ri has been spotted at 27 meetings held between the two Koreas since 2004. He is considered the right-hand man of Kim Yong-chul, the vice chairman of the Central Committee of the Workers’ Party and who was allegedly behind the sinking of the South Korean Navy corvette Cheonan in 2010, killing 46 sailors. There have been divided opinions here as to whether the CPRC qualifies as a legitimate counterpart to Seoul’s Unification Ministry, but the South Korean government noted its transition to a state agency in 2016. Before, it was not a governmental body but a branch of the North’s ruling Workers’ Party. “We believe that the South and North have finalized the organization of their delegations in a balanced way,” a Seoul official said, declining to be named. The Unification Ministry added that both sides will continue to discuss the details of the upcoming talks through the Panmunjom communications channel. Respective members of both side’s Olympics organizing committees and relevant government agencies will also come face-to-face Tuesday, which is forecast to fuel discussions on the quickly approaching PyeongChang Winter Games. In his New Year’s address, Kim Jong-un expressed his willingness to dispatch a North Korean delegation to South Korea’s alpine town of PyeongChang, Gangwon Province, and hoped for the success of the sporting event. South Korea, keen to patch up severed ties with its neighbor, welcomed Kim’s overture. Washington has agreed to South Korea’s proposal in postponing annual joint military drills that were initially scheduled to overlap with the Olympics. North Korea considers such exercises as rehearsals for an invasion, although the allies have reiterated their defensive nature. Chang Ung, North Korea’s representative to the International Olympic Committee, told reporters Saturday the reclusive nation is “likely to participate” in the Winter Games slated for Feb. 9-25. Chang said this during a stopover at Beijing‘s international airport, while he was traveling to Switzerland, where the IOC headquarters are located, according to Japan’s Kyodo news agency. He is expected to meet with IOC President Thomas Bach and other committee officials throughout his stay and head back to Pyongyang around Jan. 15, media reports here said, quoting unnamed IOC sources.